I know it seems like Thanksgiving may be a long ways away, but it’s actually now less than a month out! So, today I’ve teamed up with some incredible bloggers (all of which are amazing stylists), hosted by Lory from Designthusiasm. 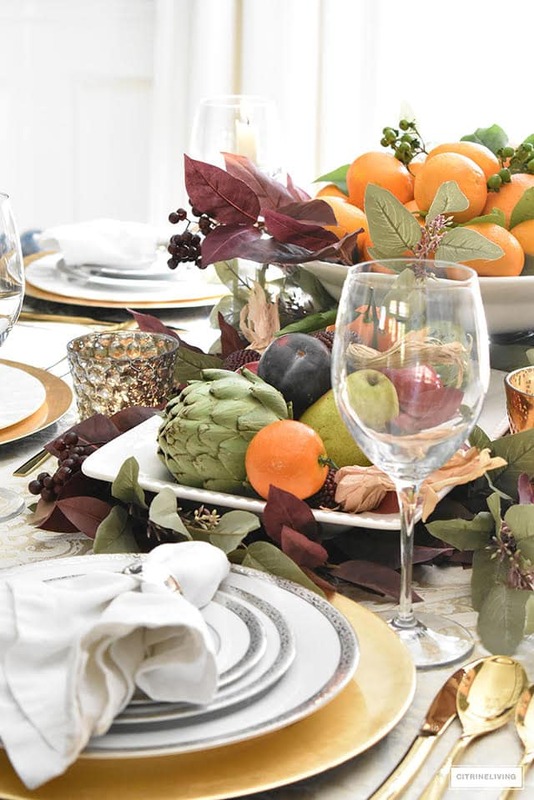 We’re sharing our Thanksgiving tablescapes and/or entertaining ideas with you so you have time to prep for your own meal(s) over the next month or so! 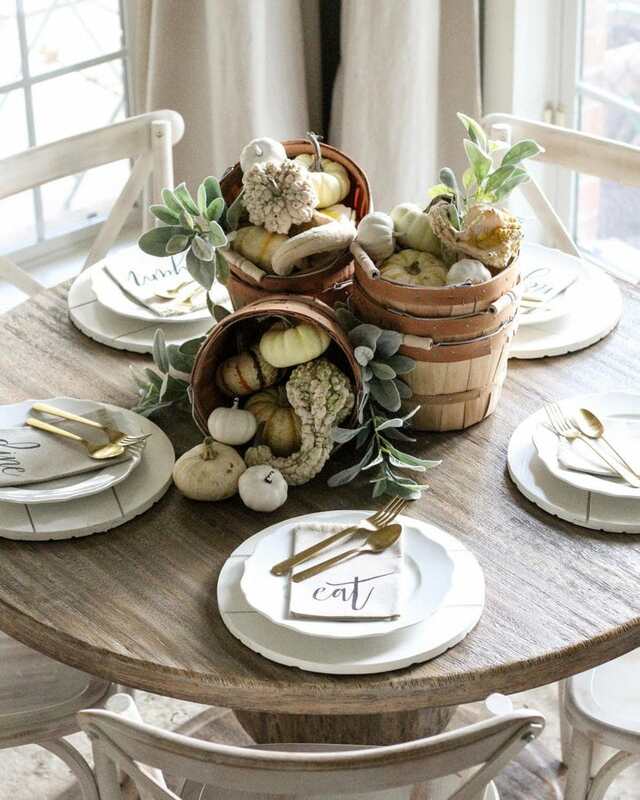 I’ll also be sharing another completely different tablescape in the next week or so to give you even more ideas! If you’re stopping in from Kelley Nan, welcome! She and I are practically soulmates and I have a feeling we’d get in a tiny bit of trouble if we lived near one another. Not only is she one of my favorite people ever, but she is crazy talented, and I can’t get enough of her or her style! 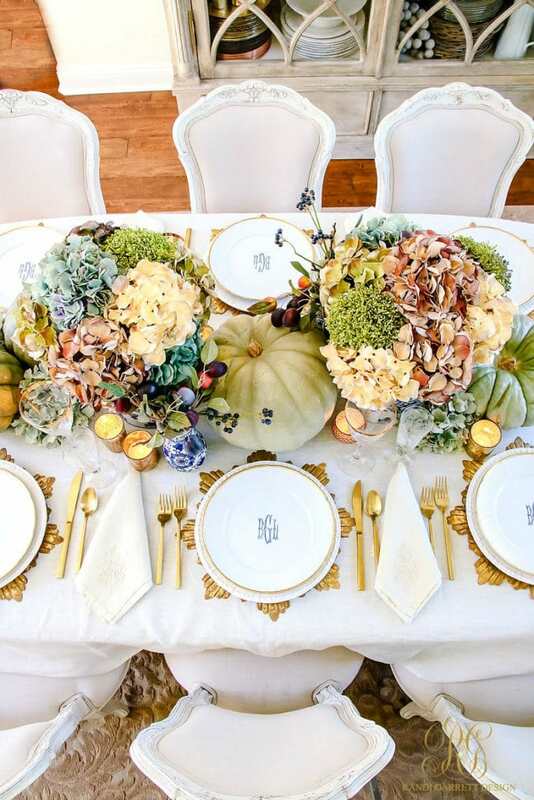 For this Thanksgiving tablescape, I went for a luxe organic vibe, using olives, plums and artichokes paired with luxe velvets. 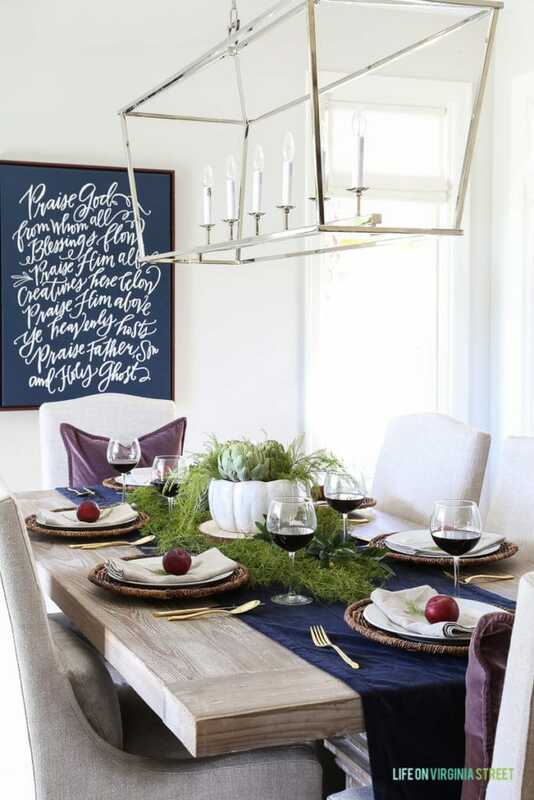 I used these washed velvet pillow covers (Napa Grape color which is currently on major sale) to bring in some of the purple tones from the fruits used in the tablescape. They add the perfect amount of texture and contrasting color to the space! 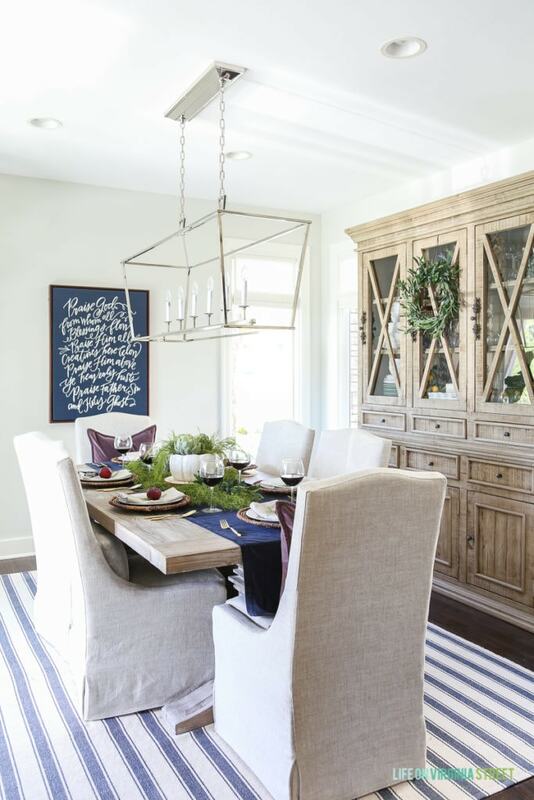 Paired with the rich navy velvet table runner, the otherwise organic look is more polished. I layered in bald cypress clippings from our yard along with fresh plums, artichokes and some faux olive branches. 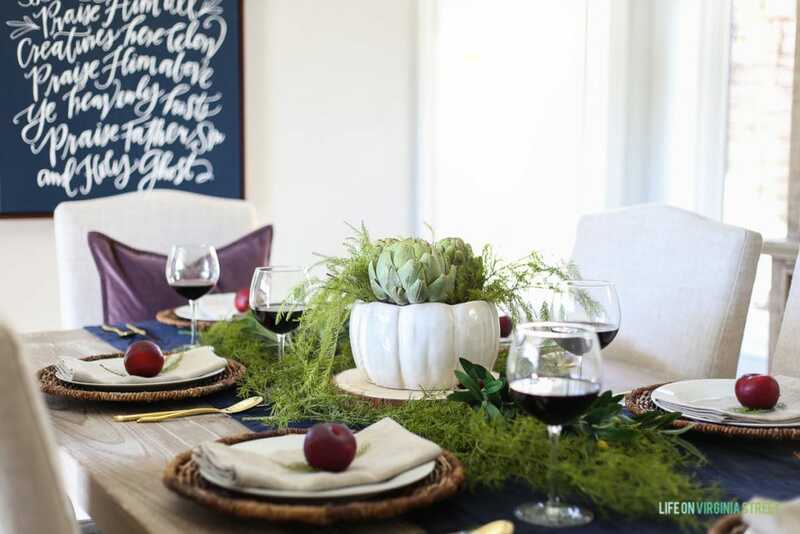 I love the combination of the jewel tones and this is proof that you can make a pretty tablescape with items from your local grocery store (or yard)! 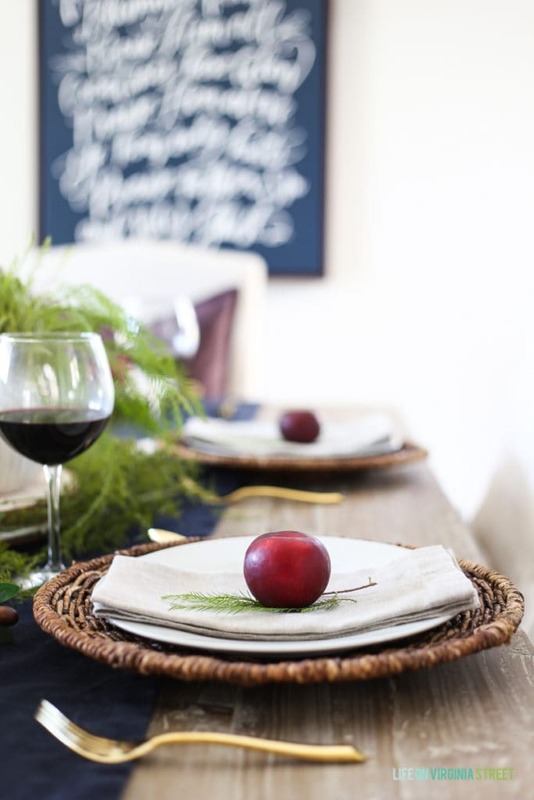 The fresh plums with a spring of bald cypress on the linen napkins make for such a pretty, natural place setting. You could certainly add tags with names if you have assigned seats at your meal. 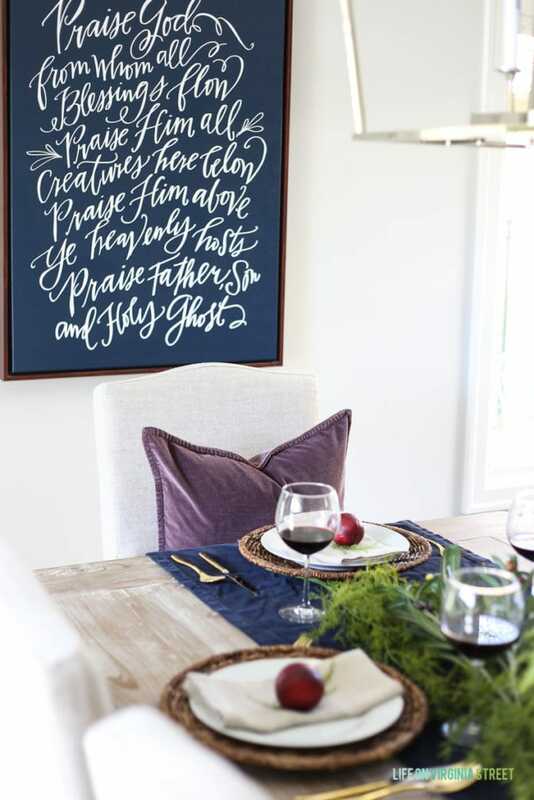 My Doxology canvas that I’ve had for a few years seemed like the perfect background for a meal all about giving thanks. It truly is one of my favorite pieces of artwork that I own and I love it’s new home in our dining room! I would typically use my pumpkin bowl for a salad or mashed potatoes (I’ve linked to my “famous” recipe), but since this was more for demonstration at this point, I filled the bowl with some fresh artichokes and clippings from our bald cyprus tree. 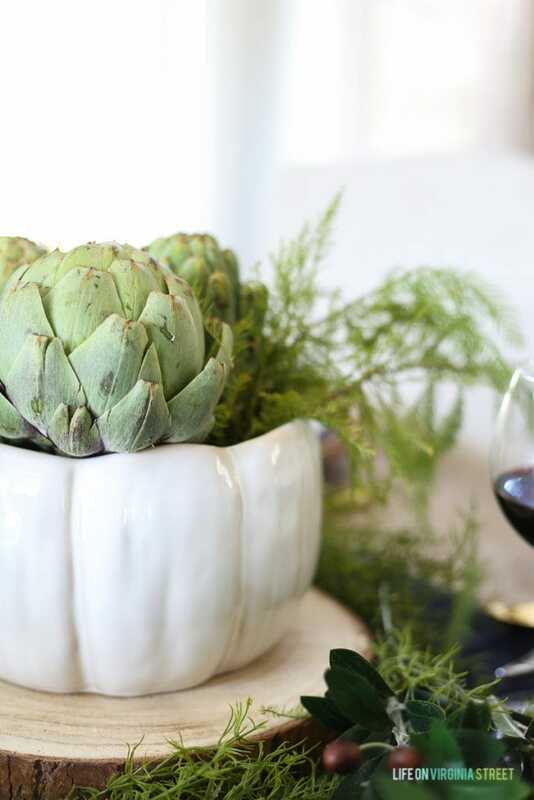 The artichokes add such a pretty color and texture to any tablescape. The bowl looks so pretty layered on top of a bark edge charger for a bit of height. I added in our woven chargers with gold flatware to provide another pretty contrast between raw and polished. 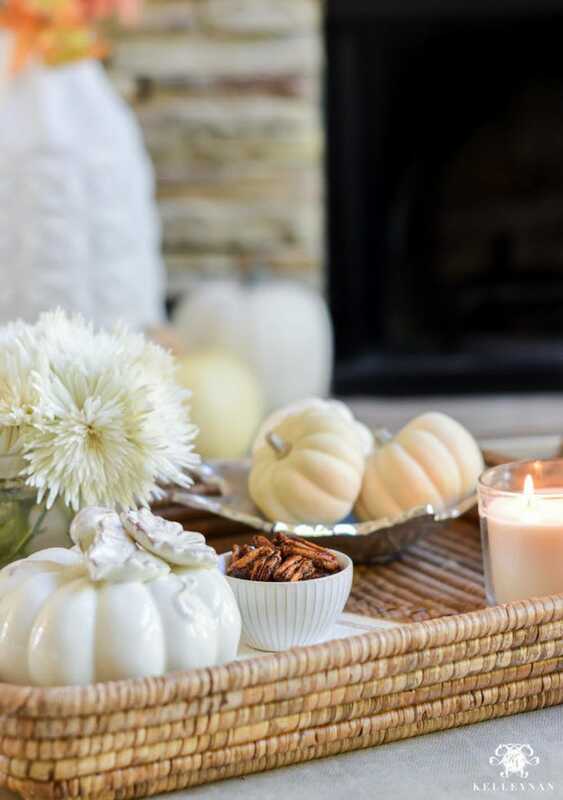 I hope you’ve enjoyed our Thanksgiving tablescape! If you’re loving for recipe ideas, be sure to try my crockpot mashed potato recipe. It’s seriously life-changing in terms of taste and the fact you can make it several days ahead of your meal! I’ve linked all of our other dining room sources below. I also have a post dedicated to very similar dining room hutch options. The next stop on the tour is our lovely hostess, Lory from Designthusiasm. 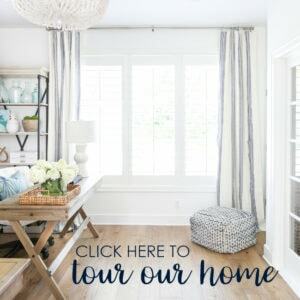 Be sure to also visit by all the other stops on the tour! Sarah what a beautiful color palette! 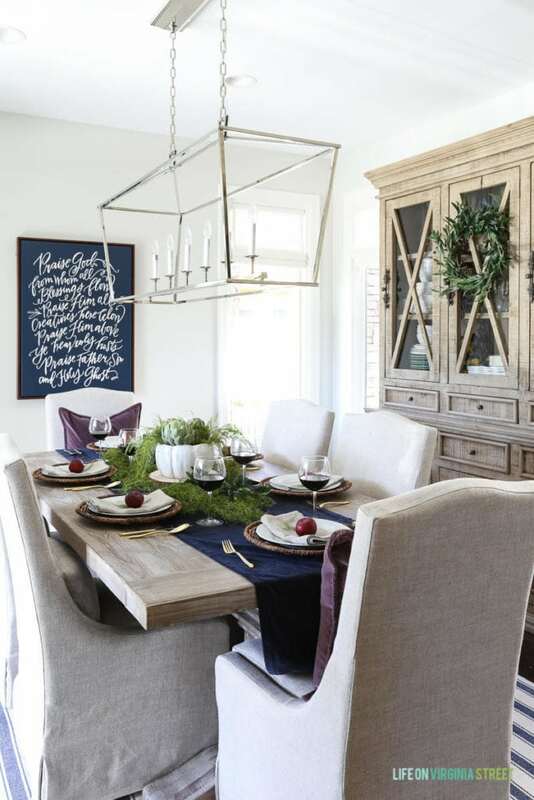 Your table is effortless and so chic – I love the simplicity and elegance! I’d love to sit in that beautiful dining room of yours! 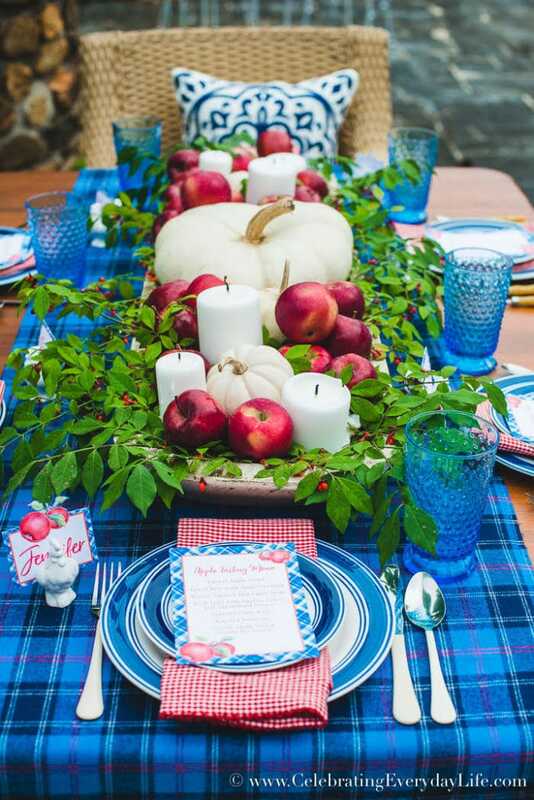 This tablescape is beautiful! The plum and navy are a unique twist on the fall season. LOVE IT! The little plums are just too cute!! Loved this whole setup! Beautiful color palette! Love the simplicity of the plums on the plates. 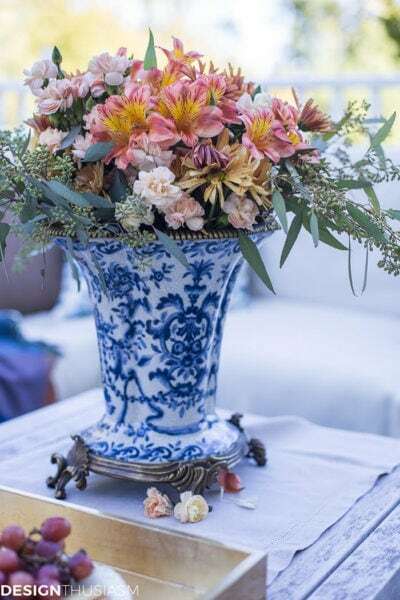 Sarah, I’m crazy in love with your color scheme and lushness on this table! Love the mix of rich darks with natural linen. It creates the perfect balance. Lovely!! The deep colors of your table setting contrast your dining room table perfectly! 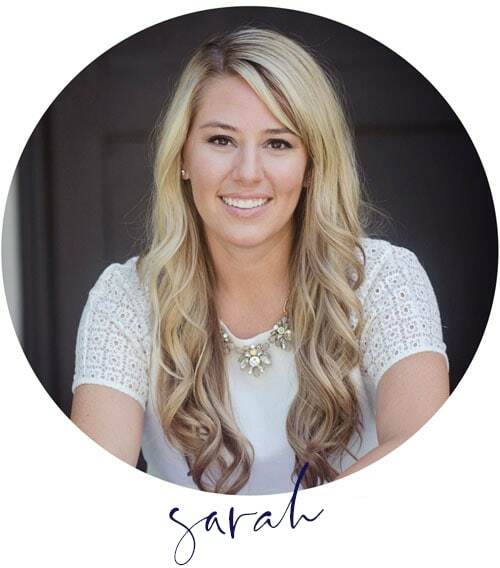 Sarah, I love the rich and natural feeling of this table! The plums are so cute – and I’m always a fan of artichokes! Hope you’re having a wonderful fall and so happy to be “hopping” with you again!